Ultimate survival is an awesome topic for outdoor lessons or language camps. 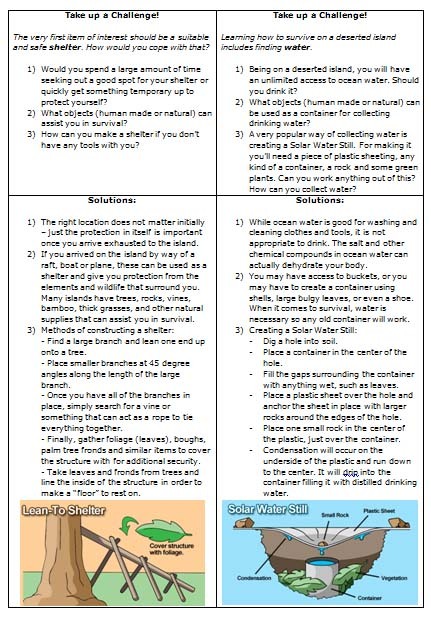 This worksheet is a discussion lesson on the topic. 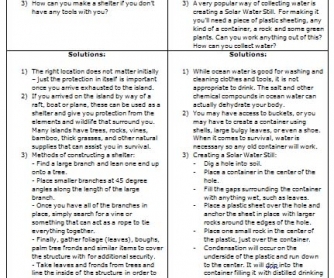 1) Students discuss the questions in small groups; 2) After they have shared their ideas, give them a few minutes to read the right answers and discuss what was new and useful to know for them; 3) Divide the students into 2 groups and give each a challenge (a) come up with the ideas how to collect water, (b) how to create a shelter). It's real fun to use some natural materials and actually try to make a small model of what they are speaking about. 4) Give the ideas of a "Solar Water Still" and "Lean-To Shelter" for information.